The echocardiographic examination showed a marked enlarged left atrium, moderate degenerative lesions of the AV-Valves, a high grade Mitral- and Tricuspidal insufficiency and systolic dysfunction. 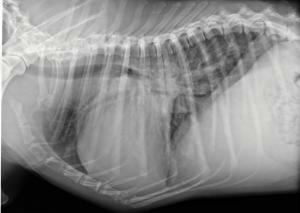 The dog suffered from pulmonary hypertension (at least 100 mm Hg) too. 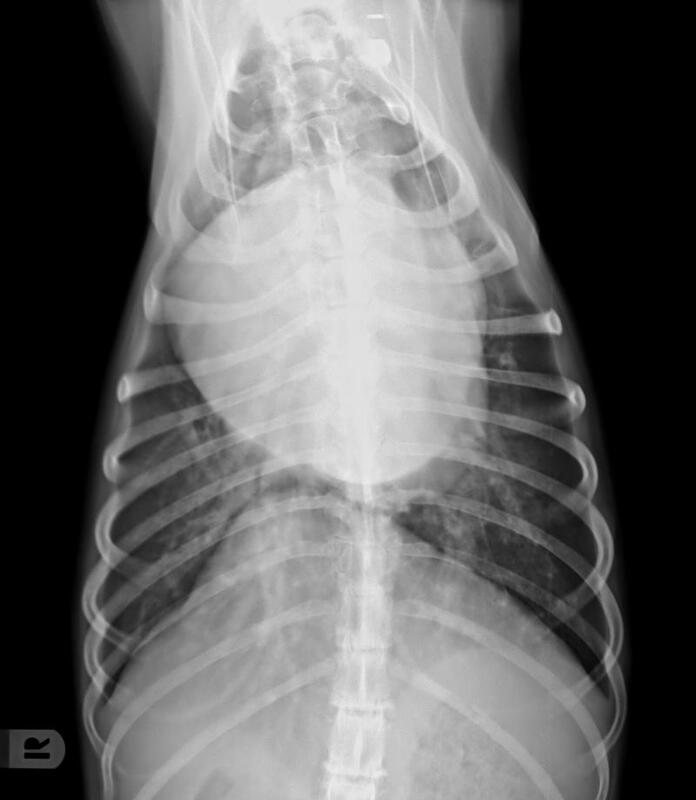 This is the case of a 12 year old doberman pinscher which was referred because of dyspnoe and a high intensity heart murmur. In the video you can easily see how the dog has to work hard at breathing and how he is standing turning his elbows outward. Note that the dog was not coughing! On the X-ray you see a generalized cardiomegaly, enlarged pulmonary veins, a severely enlarged left atrium and a perihilar lung edema formation. Myxomatous AV-Valve degeneration (MVD) occurs much less often in large breed dogs than in small ones. A clinical discrimination against Dilatative Cardiomyopathy (DCM) can already be made if the heart murmur is quite loud because DCM causes, if at all, grade I to III/VI murmurs. One other characteristic feature which helps to distinguish between the two different diseases is that DCM does usually not cause heart failure before shortening fraction is less than 13% whereas large breed dogs suffering from lung edema caused by MVD have a shortening fractions above 20%. One hallmark of MVD in large breed dogs is the fact that systolic dysfunction seems to occur very soon and prognosis is poorer than in small breed dogs. The clinical examination revealed a grade V/VI systolic heart murmur with a left apical punctum maximum. Pulse frequency was 160.